BridgeSpans bridges are made out of structural pultruded Fiber Reinforced Polymer (FRP) and structural cables. All exposed structural connections are made with tamper and corrosion resistant high strength rivets. FRP is very light weight. Although only half the weight of aluminum; FRP is pound for pound stronger than steel. FRP is non-corrosive with a built-in ultra-violet inhibitor that protects it from the sun. A color pigment is added to FRP and it does not rust or rot, therefore it does not need to be painted. 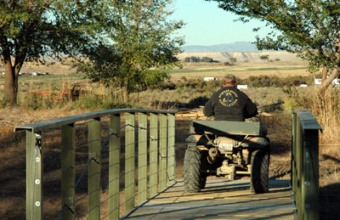 Unlike more conventional bridges, there is no required ongoing maintenance with a BridgeSpans structure. Our design blends a ridged framework of FRP with the strength of steel cable. This concept allows us to build an environmentally friendly bridge that is ridged, extremely strong, very light weight, and cost effective. 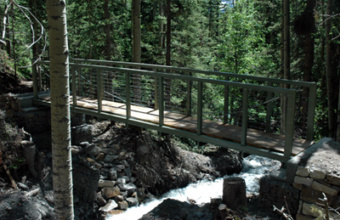 Each bridge is custom-engineered with signed/sealed CAD drawings and a complete finite element analysis (FEA). 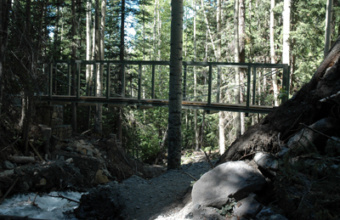 We assemble and install all of our bridges, even in the most remote locations. 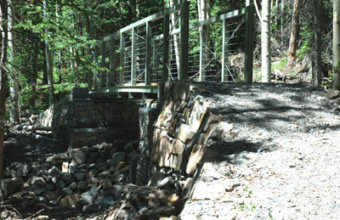 While we do not provide bridge abutments, we do offer design specifications for construction. Our standard bridges are 4 to 6 feet in width. The lengths range from 30 to 70 feet. Custom sizes are available upon request. 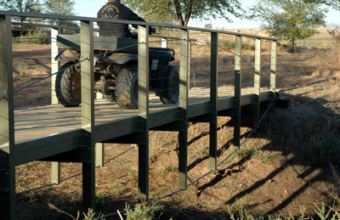 Our most cost effective and transparent bridge railing system is light cable. The deck is made of pressure treated wood with an option for FRP decking. Our bridges are installed with an approximate one degree camber. All BridgeSpans bridges are designed to meet the load requirements of our customers, but can be designed to meet or exceed design specifications as provided by the American Association of State and Highway Transportation Officials (AASHTO) in their guidelines for the design of pedestrian bridges.